With the launch of a new mechanical skeleton timepiece, Gc takes its Swiss watch making savoir-faire in combination with exquisite contemporary design to the next level of sophistication. 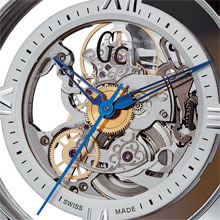 The Gc Skeleton Heartbeat edition with completely transparent sapphire crystal dial and case back offers an unimpeded view of the finely decorated mechanical ETA 2801 movement with manual winding and a 42-hour power reserve. Reduced to the minimum yet with ultimate expression through its distinct attention to detail, the Gc Skeleton Heartbeat makes a clear statement of Swiss Made Gc Smart Luxury through its architectural opulence and delicate precise craftsmanship. The pure case design and the see-through anti-reflective sapphire crystals direct all attention to the very heart of the watch where you can see the inner beauty and life of the movement with 17 jewels. The balance spring oscillates at the speed of 28.800 vibrations per hour, setting the precise pace of this Gc timepiece in a captivating pulse. The movement is suspended from the sides of the case by corresponding elegant crossbars, giving the timepiece a light yet imposing expression. Stylish blue hands give a touch of classical allure and perfect the sophisticated look. This limited and numbered edition is edited in 150 pieces with a polished stainless steel case and black leather strap with with exclusive Gc deployment buckles . 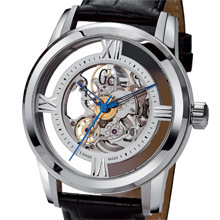 In addition, for the very first time, Gc presents a limited edition mechanical timepiece with a full-set diamond bezel. These 25 limited and numbered skeletal timepieces - stars of this mechanical collection - will be exclusively available in Gc Boutiques. The diamond models come in a steel version with genuine black alligator strap or rose gold (PVD) with a gray genuine alligator leather strap with exclusive Gc deployment buckles. An arresting mechanical edition in everything but price, these watches truly epitomise the Gc world of Smart Luxury.